If you're traveling a recreational vehicle and looking for a place to stay close to Monterey and Carmel, you may be surprised how few places you'll find to do that. In fact, the Monterey Peninsula is woefully short of places to camp, and it gets worse if you're looking for a place to camp in a tent. You could spend a lot of time searching around for non-existent campgrounds and RV parks, but you don't have to. This short list is the result of hours of online research. Veteran's Memorial Park is in the forest, but it's also only a mile from downtown Monterey. The campground has 40 campsites. Thirty of them can accommodate trailers up to 21 feet long. Hikers and bicyclists are welcome, too. The largest tent size is limited to 8’x7’ or 56 square feet. Sites have a table and barbecue pit. Water faucets are nearby, and they have restrooms. They also have showers, but you have to pay a fee for them, and they are limited to 10 minutes. Sites can't be reserved and are on a first-come, first served basis only. Get there early to snag a spot and have a contingency plan in case you are unsuccessful. Site 35 is particularly desirable at Veteran's Memorial, an isolated spot that may make you feel like you're in your own private campground. 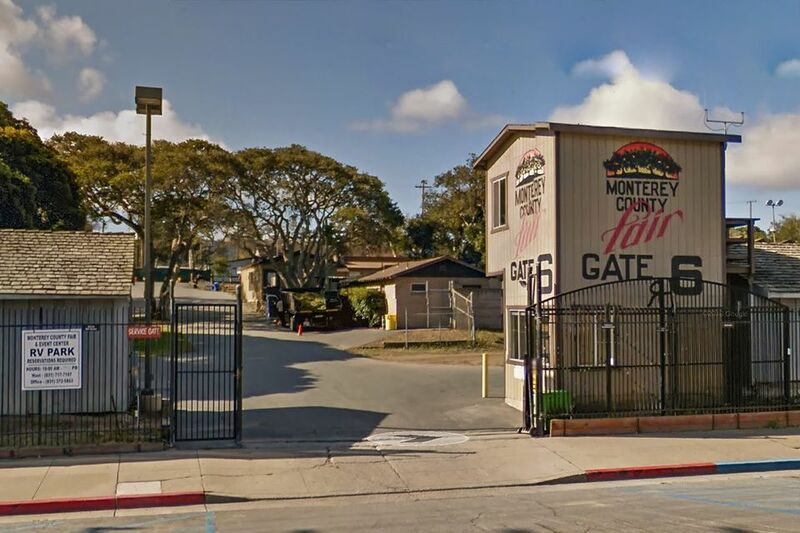 Monterey County Event Center RV Park is located — as the name suggests — at the county fair center. It's closed when the fairgrounds is in use for other events (dates are listed on their website). The rest of the year, you can reserve online, and you'll find full hookups there with 30 and 50 amp electrical, showers and WiFi. Pets and kids are welcome, and there's no size limit on your RV. They do not have tent sites. Monterey Pines RV Campground is a U.S. Military campground, located near the Fairgrounds. It's open to active and retired military personnel and civilians who work for the Department of Defense (DoD) or Nonappropriated Fund (NAF). They take reservations online. Carmel by the River RV Park is located off Carmel Valley Road about 7 miles from Monterey and 4.5 miles from Carmel. They have 30 RV spots and take reservations online. They can handle RVs up to 40 feet long, but they do not allow tent camping. They are pet-friendly and have hookups, showers, cable TV, and WiFi. Saddle Mountain Ranch is in Carmel Valley, about 5 miles west of California Highway 1 and located on 89 acres of forest land. They can accommodate vehicles up to 40 feet and have full hookups, showers, and a swimming pool. Pets are allowed with a fee. They recommend making reservations early because they fill up fast. They also have tent sites and cabins. Marina Dunes RV Resort is just a few miles north of Monterey and off California Highway 1. It has tons of amenities, full hookups, and tent sites, as well as some cottages for rent. The resort also has a restaurant. Laguna Seca Recreation Area is east of Monterey. They offer RV camping year round. It's adjacent to the Laguna Seca Raceway and particularly busy when there's a race at the track. You can check the raceway schedule at their website. Their RV sites are also suitable for popup tents with no stakes, and they have 70 non-hookup sites suitable for all tents which are available April through September. They take reservations up to one week before arrival. After that, it's first come, first served. Don't let the name fool you. The Salinas/Monterey KOA is far from the town on U.S. Highway 101. Likewise, the Santa Cruz/Monterey KOA is north of Monterey in Castroville. There is also a KOA Express in Moss Landing which is about a 20-minute drive north of Monterey. Depending on where you're going, you can also find places to camp south of Monterey and Carmel. Check these Big Sur campgrounds which are south of Carmel along the coast. Or you could look for a campground near Santa Cruz, which is about 45 miles north of Monterey.